3. Use the tweezers to pick the sticker pattern onto nail surface directly (It is self adhesive). 4.Coat the nail polish after the nail surface dry. Safe material with eco friendly technique, easy to apply onto your nails with our instructions,which won't hurt your beautiful nails. View More In Stickers & Decals. If you have any questions about this product by WOKOTO, contact us by completing and submitting the form below. If you are looking for a specif part number, please include it with your message. 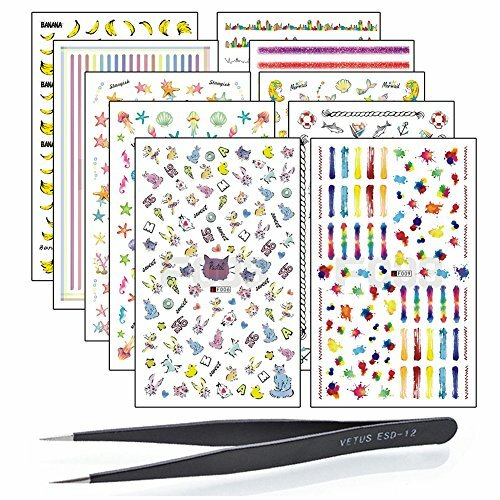 Newbested 288 Pieces 96 Designs Nail Vinyl Stencils Nail Art Decoration Stickers Set Nail Art Design Stickers Tips Decals, 24 Sheets Cute Easy Nail Art Decal Stickers Stencils.